Unless very lucky, most mamas-to-be have will deal with nausea at one point or another during their pregnancies. Some may become more accustomed to nausea than others by dealing with it way past their first trimester. Anti-nausea medications are one way get some relief. But they often come with negative side effects such as drowsiness. That’s why many women gravitate towards more natural remedies. In this article, I’ll share 8 science-backed natural remedies proven to help reduce nausea. If you prefer getting this info through a video format, simply click on the video below. If you prefer reading it, just keep scrolling! This one probably comes as no surprise since ginger is one of the most popular anti-nausea home remedies. The exact way in which it works is not fully understood. But experts believe it may act in a way similar to anti-nausea meds (1, 2). And there’s plenty of research backing its effectiveness during pregnancy (3, 4, 5, 6). There’s currently no consensus on the best dosage to use. However, most studies reporting anti-nausea effects gave participants between 0.5 to 1.5 grams of dried ginger root per day. That’s around 1/3 to 1 tsp of ginger or 2 to 6 tablespoons of fresh ginger. 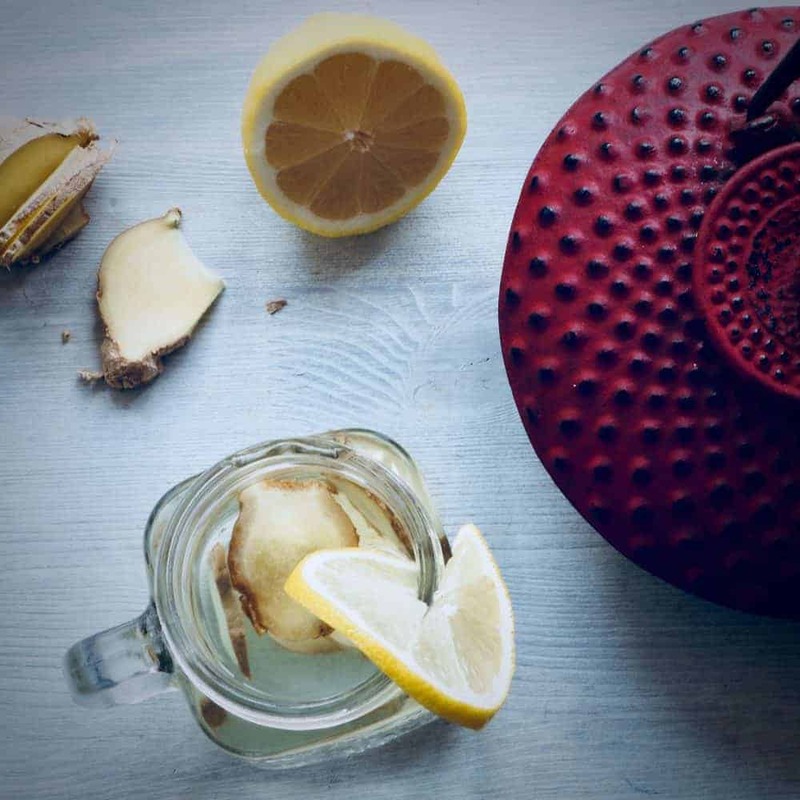 You can add ginger to your meals, or mix it into hot water to create a warm gingery tea. There are only a small numbers of studies done on ginger and pregnancy. Yet, the ones performed on healthy pregnant women report low risk of side effects. That’s why most experts consider ginger as a safe and effective anti-nausea remedy during pregnancy (3, 7, 8, 9). However, you may need to limit your intake if you’re taking blood thinners or are prone to having low blood pressure or low blood sugar levels (1). In sum: Ginger is an effective natural anti-nausea remedy. For most effects, try consuming 0.5-1.5 grams of dried ginger root or 2-6 tablespoons of fresh ginger per day. Aromatherapy is another effective anti-nausea alternative remedy. The following two aromas seem to be particularly effective. Peppermint oil was a life saver during my first trimester with my little one. I carried a little jar of peppermint essential oil with me at all times. Whenever I felt a bout of nausea come on, a couple of sniffs is all it took to make it go away. I hope that this nausea-busting effect also works for you! Luckily, there’s a good chance it will since many studies confirm its effectiveness. For instance, one study gave women who had nausea just after giving birth either peppermint oil, anti-nausea meds or a placebo. The women were then asked to rate their levels of nausea. The women in the peppermint group rated their nausea levels significantly lower 5 minutes after smelling the peppermint oil compared to those given the anti-nausea meds or the placebo (10). In two other studies, peppermint aromatherapy was effective at reducing nausea 44-57% of the time. In some cases, it did so within as little as two minutes of sniffing the oil (11, 12). Lemon is another aroma effective at reducing nausea. Pregnant women asked to inhale lemon essential oils as soon as they felt nauseated rated their nausea levels 9% lower than those asked to smell almond oil (13). In sum: Aromatherapy with peppermint and lemon essential oils may also help reduce the severity of nausea. In some cases, they may even cut symptoms in half. Acupuncture and acupressure are two techniques often used in traditional Chinese medicine to treat nausea and vomiting. Both stimulate nerve fibers, which transmit signals to the brain and spinal chord. These signals are thought to help reduce nausea. As far-fetched as this may sound to some people, there’s actually some research supporting these techniques. For instance, two recent reviews report that acupuncture and acupressure may reduce the likelihood of developing nausea after an operation by up to 75% (14, 15). Both techniques may also lower the likelihood of developing nausea after chemotherapy treatment. It may also lower its severity y (16, 17). More studies need to be done on pregnant women. However, there is at least some evidence that acupuncture may also effective at reducing nausea during pregnancy (17). The studies that report benefits stimulated an acupuncture point called the Neiguan (or P6) point (18). You can stimulate this nerve on you own by placing your thumb 2-3 finger widths down from your inner wrist, between the two prominent tendons. Once you’ve located it, press down with your thumb for about one minute. Then, repeat on our other wrist. In sum: Acupuncture and acupressure are two nerve stimulation techniques likely to reduce nausea in some instances. Most benefits appear to result from the stimulation of the Neiguan point, located right below the wrist. Slow deep breaths aren’t just good for reducing stress levels, they may also help reduce nausea. This discovery was made somewhat accidentally. Researchers were trying to compare the effects of different aromatherapy treatments on nausea. They asked participants breathe in different aromas in a very controlled way. Interestingly, they noticed that all participants felt less nauseous, even those given the placebo aroma. So they started thinking that the controlled breathing pattern may actually help reduce nausea in and of itself (19). They tested their theory in a new study and found that the controlled breathing pattern did help reduce nausea, both by itself and in combination with aromatherapy (11). To replicate the specific breathing pattern used in the studies, start by inhaling through your nose to a count of three. Then, hold the breath to a count of three. Finally, exhale to a count of three. In sum: Controlled breathing appears to be effective at reducing the intensity of nausea, both by itself and in combination with aromatherapy. Relaxing your muscles may also help relieve nausea. Scientists found two specific techniques to be particularly effective. The first is called progressive muscle relaxation and it requires you to tense and relax your muscles in a continuous sequence (20, 21). If you’re interested in giving it a try, feel free to check out this guided session. The second muscle relaxation technique which appears to help reduce nausea is the good old massage. In one study, a group of patients undergoing chemotherapy were offered a 20 minute lower arm or lower leg massage during their treatment. The massaged participants were 24% less likely to feel nauseous after their treatment compared to those offered no massage (22). Although the effects of progressive muscle relaxation and massage haven’t been specifically studied during pregnancy, they are definitely worth a shot. At the very least, it’ll be a good excuse to ask your loved ones for a foot rub! In sum: Progressive muscle relaxation and a massage are two techniques shown to help relieve nausea in some situations. It is possible that they are also effective during pregnancy, and are definitely worth a shot. Vitamin B6, also known as pyridoxine, is very often used as an alternative to or in addition to anti-nausea medications. And for good reason, as several studies find it to effectively reduce nausea during pregnancy (23, 24, 25, 26). This is likely the reason why several experts recommend it as a first line treatment against mild nausea (27, 28). Doses up to 200 mg per day are generally considered safe and have virtually no side effects (28, 29). In sum: Vitamin B6 is an effective alternative to anti-nausea medications and a good first-line treatment against mild nausea. In addition to the alternative remedies mentioned above, here are a couple of extra tips likely effective at keeping nausea at bay. Avoid spicy or fatty foods: Blander foods help relieve nausea more effectively and decrease the likelihood of an upset stomach. Add protein to your meals: High-protein meals fight off nausea better than meals that are high in carbs or fats (30). Keep your meals light: Smaller, more frequent meals can help reduce nausea. Stay upright after you eat: This is especially helpful if you tend to experience reflux or nausea within 30 – 60 minutes following your meal. Don’t drink with meals: Drinking with meals can increase feelings of fullness, which may worsen nausea for some women. Stay hydrated: Dehydration can make nausea worse. If you’re also vomiting, it’s especially important to replace the lost fluids with electrolyte-rich fluids such as flat mineral water, vegetable broth or a sport drink. Flee strong smells: These can trigger nausea in some women. Exercise: Aerobic exercise and yoga may be particularly helpful at reducing nausea (21, 31). Avoid iron supplements: If you get enough iron from your diet and have normal blood iron levels, you should avoid iron supplements because they may worsen nausea (32). Some of these tips aren’t supported by strong scientific evidence. That said, they also pose very little health risks, which makes them definitely worth a shot. Nausea is very common in pregnancy and it can make you feel pretty lousy. If you’re currently dealing with nausea, I truly feel for you. I hope that at least one of the remedies and tips in this article helps provide you some relief. However, if your nausea is severe or persists despite giving these tips a try, make sure to seek additional advice from your healthcare practitioner. Do you have another effective way to get rid of nausea? If so, please share it in the comments below so we can all benefit from it! Also, if you haven’t already, I encourage you to sign up to the Veggies & More Newsletter using the sign-up form below. It’ll offer you a direct line to ask and receive answers to your specific nutrition questions and make it easy to receive more practical tips like the ones shared today.